What type of anesthesia is appropriate for surgery on De Quervain´s syndrome (De Quervain´s tenosynovitis)? How does one achieve a radial nerve block? Why does one not inject the anesthetic agent directly into the immediate surgical area? What is the disadvantage of a nerve block to the hand or forearm? What does brachial plexus block mean? General anesthesia is hardly ever required for surgery on De Quervain´s syndrome! Most surgeons (surgeons, hand surgeons, orthopedists) prefer nerve blocks for this type of intervention. The radial nerve block (the radial nerve in the forearm is numbed) or the plexus block (the entire arm is numbed) are the typical anesthesia methods used for surgery on De Quervain´s syndrome. The red arrow in the graph marks the spot where the incision will be placed. The blue arrows show the course of the radial nerves within the operating area. The image shows the radial nerve (actually the superficial branch of the latter) in yellow. When injecting an anesthetic agent close to the nerve (blue arrows), within minutes the area of the skin incision (red arrow) will numb up. 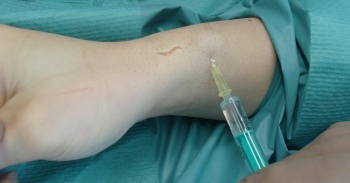 The image shows a radial nerve block being performed in connection with surgery. In this case the radial nerve block became necessary in addition to a brachial plexus block which did work, however, left the patient with a residual sensitivity during the skin incision. The anesthetic agent is not injected directly into the operating site as it would (along with potential minor bleedings) impair precise vision needed to avoid accidental damages to the radial nerve (or to one of its branches). Most hand surgeries need to occur in a bloodless operating surface environment. This greatly reduces the risk of injuring nerves or blood vessels. In fact, this is particularly true for the radial nerve and its branches which run superficially within the operating site and which could – unless clear vision is secured – easily be damaged. 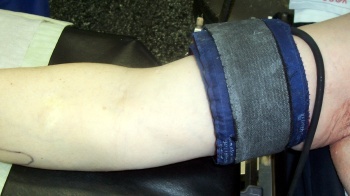 In order to achieve a bloodless operating surface during surgery on the first extensor compartment (or rather the constricted sheath) a cuff is applied to the upper arm (similar to a blood pressure cuff). Application of a cuff to secure a bloodless operating surface for surgery on De Quervain´s syndrome (De Quervain´s tenosynovitis). Just like for the blood pressure cuff the “bloodless” cuff is then pumped up with air which will create an unpleasant pressure sensation to the upper arm. All anesthesia methods which are geared towards the numbing of the nerves of the forearm or hand will have the downside of the unpleasant pressure sensation as a side-effect of the cuff pressure to the upper arm! Therefore many surgeons prefer the brachial plexus block even for surgery on trigger finger of the thumb. Clear illustration of the nerve tracks running in the armpit. 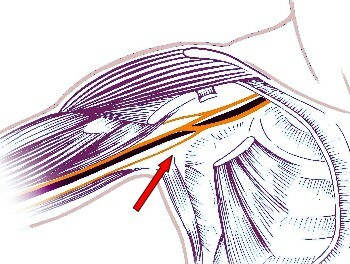 In case of brachial plexus block a local anesthetic agent is injected close to the nerve network in the shoulder area. Execution of a plexus block in preparation of surgery on De Quervain´s syndrome. For procedures on hands, forearms and elbows the injection of the anesthetic agent into the armpit is customary. One of the great advantages of this procedure is the duration of numbness that keeps the patient painless after surgery on De Quervain´s syndrome for an extensive period of time, thus potentially reducing the amount of pain killers significantly.